Evil Geniuses have announced some major changes to their roster which include a role swap, a brand new player and a brand new coach. Evil Geniuses form this season has been good but not outstanding. They attended four Pro Circuit events since it started with their best results top 4 at the PGL Open Bucharest and 3rd at the DreamLeague Major. Earlier this evening Evil Geniuses announced the big news that they would be welcoming Rasmus 'MiSeRy' Fillipsen to the roster, with Saahil 'Universe' Arora the player leaving to make room for his addition. "This is a hard day. Universe has been a cornerstone of our Dota 2 roster for many years, and the decision to reconfigure the roster without him as a part of it was not one taken lightly. Words cannot thank him for what he has brought to this team and our fans. We wish him the best," said Phillip Aram, Evil Geniuses COO in the announcement. 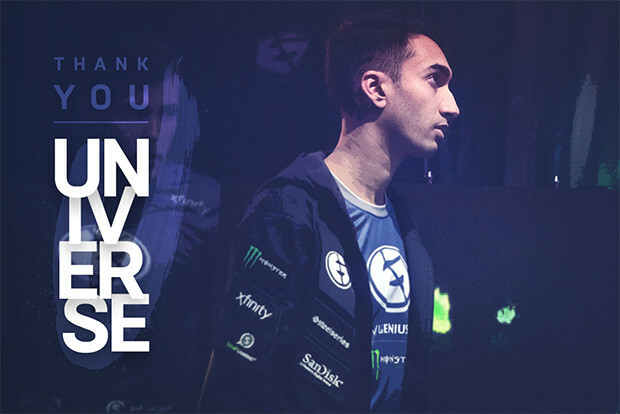 Misery will not only be EG's new support player but also their new captain. The captaincy was previously Clinton 'Fear' Loomis's, but the EG veteran will now be moving to take over the mid-lane. As part of the new roster Sumail 'SumaiL' Syed Hassan will be following in the footsteps of Gustav 's4' Magnusson and Adrian 'Fata' Trinks by transitioning from a mid player to an offlaner. During his time in Evil Geniuses as part of various rosters, Universe played a total of 1,061 matches for the organisation. The only player to play more games for EG is Fear, who has played just 2 matches more. What is more Universe is one of only 8 players to have played over 1,000 games for one organisation. As mentioned in several interviews with the likes of now COO Philip Aram and former CEO Peter "PPD" Dager, Universe did play a role in making decisions for the player owned organisation, but the official announcement makes no mention of him continuing to play any form of managerial role within EG. The announcement also does not include any statement from Universe about whether he has plans to continue competing. Due to Universe being part of two top 4 placements on the Pro Circuit he currently has 255 DPC Points, which would be transferred to any team he joined. if only your team was capable of winning tournaments, you wouldnt have to tag others to stay relevant in the scene, its a shame.. Finally EG revealed that coach Avery 'SVG' Silverman has left the team to pursue a return to competing himself. Filling his place will be Dota Summit 8 host and a former EG player, Sam 'Bulba' Sosale. All in all this means that in 2018 Evil Geniuses will be playing with a new player, a new captain, two role swaps and a new coach.